Auburn University began in 1856 as East Alabama Male College. Later, in 1872, the college became a state institution – the first land-grant college in the South to be created separate from a state university. The name was changed to Agricultural and Mechanical College of Alabama. Along with state funds came the mandate that exercises in “military tactics” be taught to all able students. These military exercises were accompanied by a drum corps consisting of twelve cadets in the early years. In 1897 it occurred to M. Thomas Fullan, an instructor of mechanical arts, that an instrumental band would be an improvement. Fullan met with then-president Dr. William Broun and suggested making the corps into a college band. With funds from the entire student body, local business donations, and the gifts of faculty members, instruments were ordered and regular band practice began. While waiting for the instruments to arrive by express delivery, the band relied on a core of instruments including an old brass tenor horn dubbed “Jenny Lind.” Mr. Fullan wrote, “Since the instrument was in B-flat and my B-flat cornet tuned with it the early band was nursed on it…Of course the ten or twelve boys lined up in ‘barber shop’ manner, waiting for their turn with ‘Jenny Lind’ with me accompanying them on my cornet.” Thus the Auburn University Bands trace their beginning to 1897, director M. Thomas Fullan, a tenor horn named “Jenny Lind,” and a single bass drum. 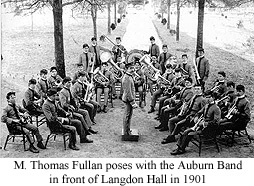 In 1906, Albert L. Thomas (who had begun as Assistant Director to Fullan in 1905) became director of the Auburn Band. He inherited a strong band with experienced players who were already well-known throughout the state thanks to fine performances at Mobile’s Mardi Gras and other events. 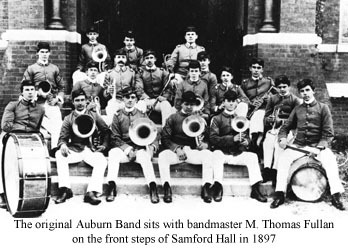 To Mr. Thomas the band owes a debt of gratitude for his continuous efforts to make the organization a fully recognized, funded, and all-around official part of the University, which had been renamed Alabama Polytechnic Institute (API) in 1899. Under his direction, the band performed at the 1915 Confederate Veterans Reunion in Selma, AL and was dispatched (along with four battle companies) to a 1916 border dispute with Mexico. 1917 brought a new director in the person of P.R. “Bedie” Bidez, who had been Thomas’ assistant from 1911-1917. He was known to band members and the rest of the campus simply as “Chief.” The band continued to grow under his leadership. In 1917, Bidez led the Auburn Band (under the name of the 16th Infantry Regimental Band) into Europe during World War I. As the band crossed the Rhine from France into Germany they struck up Glory to Ole Auburn to celebrate the allied victory. In 1924, back at home in Auburn, a cornet player in the Auburn Band by the name of Bill Wood decided that the school needed an original hymn that could be sung at all events and occasions. In his senior year he wrote Auburn’s Alma Mater which is sung to this day. When Wood died in 1933 the band played the piece in a ceremony at Langdon Hall in his memory. “Bedie” Bidez would remain Director of the Auburn Band from 1919-1951. During his 32-year tenure, the band tripled in size and Auburn saw many important changes and events. In 1939 Auburn Stadium (what is today Jordan-Hare Stadium) was opened with a capacity of 7,500. And in 1945 the Auburn University Department of Music was established, making band and music officially part of the education and curriculum of Auburn men and women. The band was a part of important events at home and across the country, including a performance in Auburn for president Franklin D. Roosevelt and a trip to march in President Harry Truman’s Inaugural Parade in 1949. It was in that same year that a Band Alumni Club was formed. Under the direction of Bidez, the band began traveling to several away football games each season and scholarships and support for members was increased. In 1946, a big change swept through the band with the addition of female Majorettes, although no women began playing instruments until 1950. In 1951, David A. Herbert took over as Director of the Auburn Band. The band had 96 members and he used them very creatively to fill the field with interesting drill formations. After one game versus Alabama, Grover Hall wrote in the Montgomery Advertiser that the Auburn Band’s “formation of umbrella’s, letters, names, etc. was the epitome of parade ground precision; it was imaginative and engaging.” Herbert also pushed the band into newer territory, hosting the first Summer High School Music Clinic in 1951 and making the Auburn Band’s first recording in 1952. In 1955, the torch passed to Burton R. Leidner, who introduced one of the biggest changes in Auburn history. 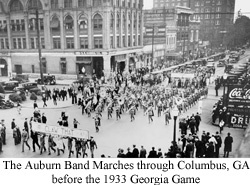 The Auburn Band had been playing the Auburn Victory March as a fight song for decades. But in 1954, Auburn supporter Roy B. Sewell thought that the old tune was outdated and something new was in order. After several failed attempts from students and fans, Sewell commissioned two New York songwriters named Robert Allen and Al Stillman to write the words and music for a new fight song. Thus War Eagle was born as the new Auburn fight song. Roy Sewell wrote, “Boy, we have a peach of a song,” and the new tune was premiered at the Auburn-Chattanooga game in September, 1955. At first, War Eagle was not well-received, but Leidner played it every chance he could at games, ceremonies and more. Over time, Auburn fans grew to love it and now it is a deep part of Auburn tradition. Dr. Wilbur “Bodie” Hinton became Band Director in 1956. Because of his contagious enthusiasm and help from the athletic department, especially Athletic Director Jeff Beard and Coach Ralph “Shug” Jordan, Dr. Hinton was able to launch many efforts toward improvement. The band was widely acknowledged as a great marching band, and the A.U. Department of Music had the largest music major enrollment of any state school. The progress continued in 1957 when the band discarded the old gray cadet-style uniforms in favor of sharp “Yale-style” uniforms in crisp orange and blue. To Dr. Hinton, the Auburn Band owes its continuing commitment to hard work, enthusiasm, and most importantly class. He insisted that Auburn men and women demonstrate class in all paths of life. Today that spirit lives on in the annual Hinton Award, voted on by the Auburn University Marching Band and presented to the senior who best demonstrates the “Spirit and Excellence that is The Auburn University Marching Band.” The Auburn Band practices on Wilbur “Bodie” Hinton Field, one of the finest outdoor practice facilities in the country. In 1969, Dr. Hinton became Head of the Department of Music and Assistant Director, Dr. Bill Walls became Band Director. Dr. Walls selected the first female drum major of the Auburn Band, Deborah Whatley, in 1972. He also was present when the Goodwin Band Building was built in 1973, thanks to a generous gift from James and Virginia Goodwin of Birmingham, AL. In 1985 the Marching Band adapted to the times, adding a Flag Corps for color and effect on the field, and purchasing new “West Point-style” uniforms. The Hinton Field outdoor practice facility was completed in 1985 as well. In 1987, the First Annual Alumni Band Reunion was held and a band of alumni joined the student band on the field at a football game, a tradition that continues today and brings over 300 alumni back to Auburn each year. 1989 saw the first performance in dress-black attire by the Auburn University Symphonic Band, and the Marching Band participated in the 1989 George Bush (Sr.) Presidential Inaugural Parade in Washington, DC. Dr. Johnnie B. Vinson took over as Director of Bands in 1991. He had served as Assistant and Associate Director from 1969-1974 and 1976-1990. 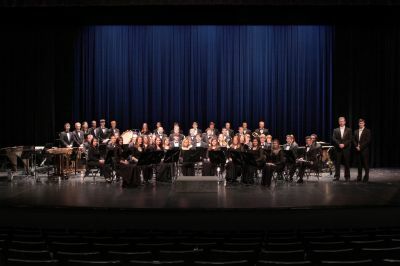 Under his leadership, the Auburn University Symphonic Band became established as a dress-black ensemble and the premiere performing group in the band program. In 1992, the first Auburn University Marching Band compact disc was recorded and distributed, an event repeated every year since then. In 1997 Dr. Vinson presided over the Auburn Band’s Centennial year, with the publication of the book The Auburn University Band: A Centennial History marking the occasion. In addition, noted composer James Curnow was commissioned to write Centennial Spirit: Fanfare for a Noble Occasion, a work premiered by the Auburn University Symphonic Band. In 1999, the Symphonic Band performed for the 65th Annual Convention of the American Bandmasters Association where they premiered Dr. Vinson’s American edition of Russian composer Boris Kozhevnikov’s Symphony No. 5. Vinson retired in 2007. Dr. Rick Good was promoted to Director of Bands in June of 2007 after serving for 13 years as Associate Director of Bands, Marching Band Director and Associate Professor of Low Brass. While director of the Auburn University Marching Band, enrollment increased to over 375 members during the fall of 2006, the largest in university history prior to his promotion to Director of Bands. In 2005, the Auburn University Marching Band performed in the Inauguration Parade of President George W. Bush. This was the third performance in an inaugural for the Auburn Band. The Auburn Bands performed internationally for the first time in 2008. Invited by the Lord Mayor of Dublin, the Auburn University Marching Band represented our university, state, and country by performing in their annual St. Patrick’s Day Parade. Other performances during that trip included marching in the St. Patrick’s Festival Band Parade in Limerick and playing in the Guinness Brewery in Dublin. The Auburn University Band is well on its way to another successful century. The fact that there have been only nine directors in over 110 years suggests a stability and continuity in the A.U. Band program that has contributed to its success. The 2008 Auburn University Marching Band in Dublin, Ireland.